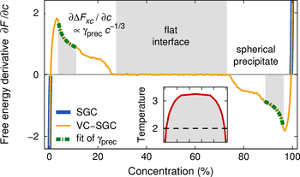 We present an extension of the semi-grand-canonical (SGC) ensemble that we refer to as the variance-constrained semi-grand-canonical (VC-SGC) ensemble. 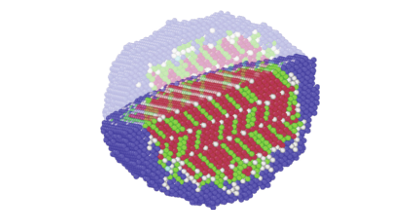 It allows for transmutation Monte Carlo simulations of multicomponent systems in multiphase regions of the phase diagram and lends itself to scalable simulations on massively parallel platforms. By combining transmutation moves with molecular dynamics steps, structural relaxations and thermal vibrations in realistic alloys can be taken into account. 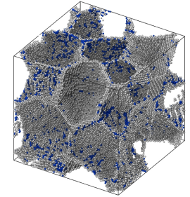 In this way, we construct a robust and efficient simulation technique that is ideally suited for large-scale simulations of precipitation in multicomponent systems in the presence of structural disorder. To illustrate the algorithm introduced in this work, we study the precipitation of Cu in nanocrystalline Fe.